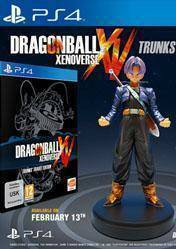 Physical version of Dragon Ball Trunks Xenoverse Travel Edition for PS4 (Plastation 4), wich includes the original game Dragon Ball Xenoverse and a Master Stars Piece figure of Trunks of 25 inches, a deluxe edition for the fans of the series. In this new installment of Dragon Ball universe action game for PS4, Goku and his friends return to action with a graphic and gameplay level unprecedented in the series. One of the highlights of this new release is that we can create our avatar or fully customizable character, from the physical aspect to the powers that will be used against our enemies. We may intervene in all the battles of our friends and change the future in the game. Remember that this version for PS4 is a physical version, and delivery times and shipping rates will depend on the store where you buy it, so we recommend you read all the information on each store before buying this collector's edition of Dragon Ball Xenoverse. So you can beat up Krillin in this game. That alone is worth playing, but wow is this pack expensive now that the preorder's over!